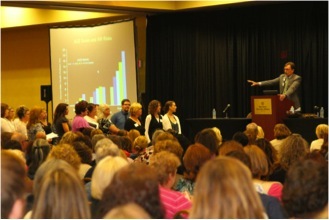 Dr. Robert Anda explaining life to “12-year-olds” at Iowa’s first ACEs Summit in Des Moines. the loss of a parent through abandonment or divorce. So, at the very least, these kids, the smokers, are dealing with the effects of those adverse childhood experiences — anxiety, depression, and difficulty concentrating, he explained. Nicotine makes those effects disappear….for a little while. And when they come back, what makes them go away again? Another cigarette. Anda asked the people who were sitting to give those who were standing a round of applause for “figuring out a biochemical coping strategy”. This was Iowa’s first ACEs Summit, where community leaders from around the state learned about research on the impact of toxic stress on early brain structure and its lifelong impact on health outcomes. 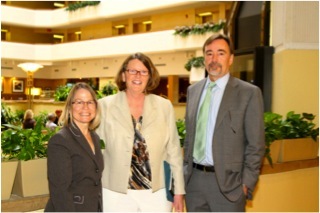 Anda, co-founder of the CDC’s Adverse Childhood Experiences Study, presented the study’s findings that link ACEs with depression, anxiety, suicide, chronic diseases and disabilities that affect people in their workplaces, homes, schools and communities every day. Sonni Vierling, state coordinator of the 1st Five Healthy Mental Development Initiative, announced that Iowa is planning on joining 18 other states that, since 2009, completed ACE Surveys through their Behavioral Risk Factor Surveillance System (BRFSS). According to the CDC, the BRFSS is the world’s largest state-based telephone health survey. It has been tracking health conditions and risk behaviors since 1984. Surveys are being done every month in all 50 states, the District of Columbia, Puerto Rico, the U.S. Virgin Islands, and Guam. The BRFSS is how we know our smoking rates have declined over the last 20 years, while our obesity rates have skyrocketed. After Iowa’s ACE survey is completed, Anda and Dr. David Brown, an epidemiologist who worked on the CDC’s ACE Study, will be doing the analysis, which Vierling anticipates being published next year. “The experience of other states tells us that Iowa-specific ACEs data will offer a powerful new way to structure state and local planning around human-service systems, public health campaigns and public policy,” she said. Of the 18 states that have completed surveys, at least four are implementing ACE concepts. These include Maine, Vermont, Washington and Wisconsin. This summer, I’ll be featuring posts about individual states’ activities and status based on Iowa’s State ACE Response Project, as well as interviews with representatives from states that have completed ACE surveys, but have yet to analyze the data. Even though New York, Illinois, Arizona and Iowa haven’t done ACE surveys, they have efforts underway to educate people about ACEs and projects that implement ACEs. 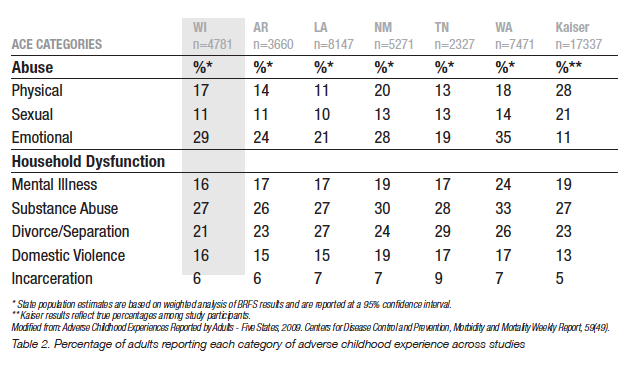 Wisconsin, which did an Adverse Childhood Experience Survey in 2010 and published its analysis earlier this year, is beginning to carry out the recommendations in its report, including creating a position for a “trauma & adverse childhood experiences coordinator”. In 2009, BRFSS ACE surveys were done in five states — Arkansas, Louisiana, New Mexico, Tennessee and Washington. The Wisconsin report compared its results with those five states and the CDC’s ACE Study, which is labeled “Kaiser” in these charts, because the study’s participants were members of the Kaiser Permanente health maintenance organization in San Diego, CA. The states’ ACE survey results are fairly comparable. They are notably different from the CDC’s ACE Study involving Kaiser members in the sexual and verbal abuse categories. That may be because the survey that Kaiser members did was a 200-question survey on paper that people filled out at home, while the BRFSS state ACE surveys are telephone surveys in which people talk with a person who asks them several questions. For more details about the Wisconsin ACE survey, you can download the report: WisconsinACEs. It’s well written, very interesting, with colorful charts and graphs, and features stories of individuals who experienced ACEs when they were children, and describes how those experiences affected their lives.